Optimum Gold Standard 100% Casein delivers 24g of pure Micellar Casein per serving that slowly digests, making it perfect for enjoying before bed to quell hunger and maintain muscle growth throughout the night. Optimum Gold Standard Casein provides your muscles with a slow-releasing source protein that supports your muscles rebuilding process all day, or night long. While many of us enjoy protein shakes through the day or after a hard workout, these fast acting proteins are rapidly absorbed and can leave us hungry and without resources to repair our muscles with during the night or between meals. Casein Protein is digested and absorbed slowly, keeping you fuller for longer and providing your muscles with a constant source of material to rebuild with. Each serving of Optimum Gold Standard 100% Casein delivers 24g of pure Micellar Casein per serving making it perfect for enjoying before bed to quell hunger and maintain muscle recovery throughout the night. 24 Hour Protein Coverage - Optimum Gold Standard Casein delivers slow release protein that is absorbed gradually over a much longer period than typical whey protein allowing you to maintain protein reserves throughout the night for superior recovery and hunger suppression. Curbs Appetite - Protein is well known for making you feel full. Ideal when on a tough diet. However, regular proteins are absorbed extremely quickly, especially when you’ve been working out. Casein is absorbed over the course of a number of hours so you stay full for hours. 5g of BCAAs - Each serving contains 5gs of BCAAs in the 2:1:1 ratio. This promises improved recovery and ensure you’re able to effectively synthesise muscle rebuilding proteins. 5g of Glutamine - After hard exercise, your muscles supply of glutamine can become depleted. This can result in your body consuming your muscles for energy, instead of going for fat or carbs. Topping up your glutamine supply protects you from this happening, so you don’t lose your gains while you sleep! 0.7g Fat - Each serving contains less than a gram of fat, so you’re not getting wasted calories that can’t be burned off during sleep. 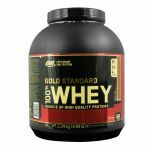 Who is Optimum Gold Standard Casein For? Optimum Gold Standard Casein ability to be absorbed slowly makes it an extremely efficient way to stay full for long and most importantly, keep your muscles supplied with protein throughout the night. For optimal results, casein is most effective when you’re also using Whey (or other fast acting proteins) throughout the day to support your muscles and regulate protein balance in your body. Optimum Gold Standard Casein ability to be absorbed slowly makes it an extremely efficient way to stay full for long and most importantly, keep your muscles supplied with protein throughout the night. For optimal results, casein is most effective when you’re also using Whey (or other fast acting proteins) throughout the day to support your muscles and regulate protein balance in your body.